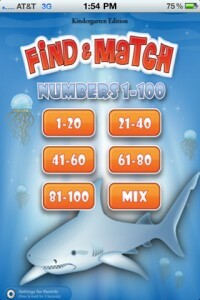 Find & Match 1 - 100 iPhone App Review. That’s what the App Store description boasts on the app page. It’s also easy to use and tested by children in focus groups. But alas, I was not part of the focus group, so I had issues with understanding the goal of the app, because it was not explained anywhere in the app. So you start it, choose the number range you want to play with and then you’re left guessing. 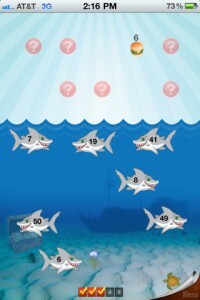 The screen features a sea of sharks, each with numbers on it. The upper part of the screen has little bubbles with question marks. Naturally, my first instinct was to play with the sharks. I moved them around to no avail. I then thought I need to order them somehow and started to pick one up and slide to the top of the screen towards the question marks. 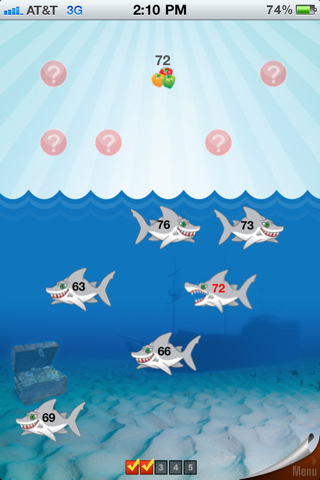 Nothing happens, but if you slide it to the upper-left side, you get a bravo and the shark goes off the screen. Ordering however made no sense. You can’t order ascending, descending, or random. So it had to be something else. Touching the question bubbles, eureka, there were numbers underneath. 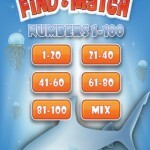 So I thought, let’s match sharks with numbers, so I started dragging sharks towards numbers. That didn’t work out. The other way around did work however. I felt like the caveman discovering fire. So there you have it: the goal of the game is to match sharks and question bubbles with the same number, by feeding each shark with the food that carries that matching number. Simply drag the food onto the shark. There are six distinct modes of play, which are essentially six different number ranges from 1 to 100. Depending on the child’s development stage, he can choose the appropriate range. 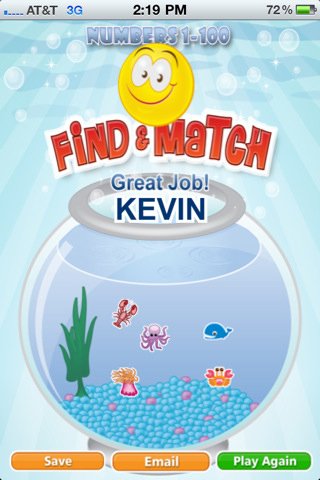 With every puzzle completed, the child can choose a sticker from a bunch. It’s not quite clear what he can do with it, since it’s nothing that he can actually touch (yes, I know the iPhone can’t spit out chocolate as positive reinforcement method, but maybe in the future?). Throughout the game, the child gets the occasional “super duper,” “yay,” “awesome” or “great.” Even when I was doing everything all wrong (that is, before discovering fire), I was still getting the same positive reinforcement. Additionally, in the settings menu, the parents can provide a name and an email address and have a personalized graphical certificate of accomplishment emailed to him. The settings menu also features a help mode. When turned on, the child will get visual cues (the correct shark wiggles its tail) as to what to do next. It’s all designed to help the child get a hang of the game. I just wish they did the same for parents. Just when you think something is dead simple to use, it doesn’t hurt to add a little tutorial, just in case. This would have saved me a lot of time. Of course, there’s no way of knowing whether kids are more intuitive with these sort of things, so I’m not going to let this omission impact the game rating. Find and Match is after all a good way for kids to develop their memory, motor skills and learn numbers along the way. What do you think of 1 - 100? Scroll down for our comment section and let us know!